Small and medium-sized mortgage companies are concerned first and foremost with finances—not branding. This entails everything from funds tracking to distribution. Marketing, at times, may take a back seat to top-line services. Still, mortgage brokers and other finance employees are professionals. In communications with partners and clients, your brand has the chance to shine or fall flat. Emails and digital documents that feature a distinctive and data-rich signature reflect well on your company. Uniformity of appearance is a main aspect of effective branding. 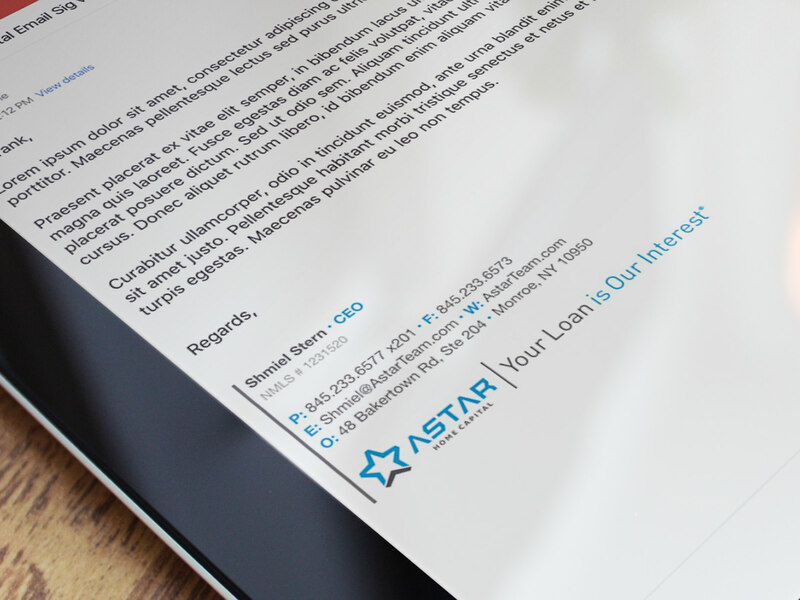 Borrowers and partners seeing disparate email design and informal sign-offs (“Cheers!”) will make assumptions about your company’s lack of professionalism. By making email signatures uniform in appearance, size, font, color, and logo inclusion, interactions go smoothly. The addition of this feature even helps with employee management issues by encouraging staff to stick with company guidelines for digital interactions. Contact Information – Phone numbers, email addresses, etc. Mortgage brokerages are email-heavy organizations. Brokers email everyone: borrowers, potential customers, regulatory agencies, lenders, colleagues, banking staff, and more. As mentioned, every email that exits the organization constitutes a piece of marketing material. Consider that every time an employee clicks “Send” there is potential to either add or take away from the company’s monetary value. An email signature is the digital equivalent of handing a professional-looking business card to every person your staff interacts with. It improves the brand’s image and gives vital information to current and potential customers. Instead of mere data exchanges, transactional emails become conversion drivers and revenue generators. Our industry is a prime target of hackers. Forbes reports that financial services institutions experience cybersecurity attacks 300 times more frequently than companies in other industries. With the potential for sensitive borrower data to be gleaned from emails, having an email signature provides an extra layer of protection. Regulation agencies and legislation, such as the SAFE Act of 2015, require that mortgage loan officers provide NMLS ID numbers on all communications. Email signatures allow your system to automatically populate signatures without piling responsibility on brokers. Email signatures also provide space for confidentiality disclaimers that inform recipients of the sensitive nature of email content. When every interaction includes this essential information, your company reduces the risk of data breach and keeps borrowers, employees, and the company safe. The final reason that mortgage companies struggle with email signatures is that they are unsure how to implement them. Does it involve a drawn-out conversation about branding? Will IT have a backlog? How will employees access it? Is there training involved? The beauty of using services with email signatures is that the functionality is built-in. IT doesn’t have to install separate software. Implementing eye-catching signatures is as easy as ticking a box. Some services, such as national leader in mortgage software ABT’s Email Guardian, even allow lenders to micro-manage their own profile in accordance with company policies. From branding consistency to compliance and ease of use, today’s technology makes email signatures a breeze. The benefits penetrate through employee consistency and reach all the way to the lender’s bottom line. To learn more about integrated email signatures and the full range of cyber security features available for mortgage companies, check out Email Guardian from ABT today.